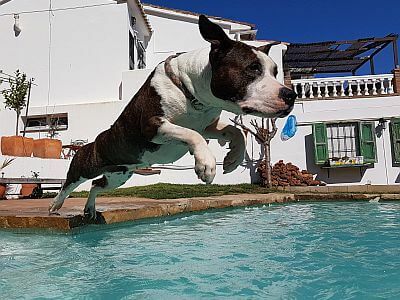 Since 2015, here in the Netherlands, Dock diving (sometimes called Dock Jumping) could be added to the list of spectactular dog sports. This exciting sport also originates in the United States. The initiator to change this sport in to a competition is our kennel sponsor Purina Proplan. The event takes place on a dock and a swimming pool, or any other water surface. The dock is usually covered with artificial turf, rubber or a carpet, and is between 11 and 12 meters in length. The height between this dock and the water surface is about 60 centimetres. 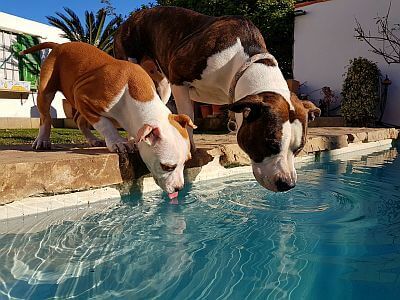 The pool or water surface must have a minimum depth of 120 centimetres. Let’s try this first …. Big Air: The score for this section is based on distance which is jumped. The measured distance of the jump will be recorded by a camera. The team winning will be the team that realises the largest jump. Diane Salts’ Cochiti, holds the DockDogs Super Elite Big Air Indoor World Record at ISE Phoenix (at University of Phoenix Stadium in Glendale, AZ) with a jump of 30′ 2″ (thirty feet, two inches) which is about 9,45 meters. Extreme Vertical: The score for this particular component is based on height. The dog will run and jump from the end of the runway and pick up an object from an extender hung above the pools surface. Here the team with the highest jump will win. Speed Retrieve: The score for this component is based on time. 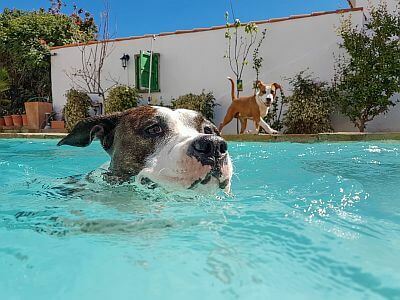 The dog will run and jump from the end of the dock in to the water and swim to the end of the pool to pick up an object. The team with the fastest time wins. With this type of sport as well, a team consists of a handler and a dog. There are different classes or divisions where the dog can compete in. All this can be depending on the age of the dog, and/or height of the dog. There are currently several organizations active in organizing this type of event, both here in Holland and in other parts of the world. Each organization will have its own rules. The American Kennel Club sees Dockdiving since 2014 as an official sport. Currently, this type of sport is not yet regulated by the F.C.I and the Raad van Beheer. We hope, like Agility and Flyball, it will be a matter of time before this exciting type of sport will be recognized.